I float and sink, water and mountain. the person who kneads me. 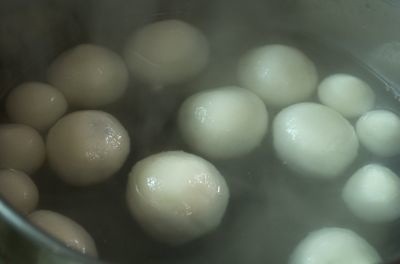 In China, where they’re known as yuan xiao or tang yuan, the dumplings are traditionally served during the Lantern Festival, which falls on the 15th day of the 1st lunar month. During an especially important season, the festival comes on the first full moon of the new year and marks the end of the new year festivities. Here in San Francisco, this is typically the time when the Chinese New Year parade winds its way up the streets of Chinatown. The dumplings are also enjoyed throughout the year at many dessert houses throughout the Bay Area. Look for them on menus at your favorite Chinese restaurant or boba tea house. The recipe for soi nuoc is very simple. 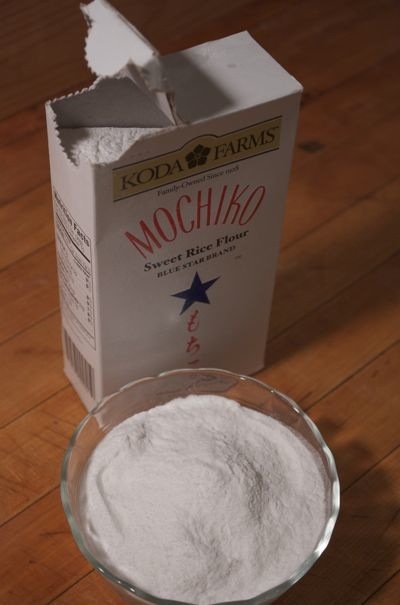 You can buy finely ground glutinous rice at nearly all Asian markets (look for California’s own Blue Star Mochiko, produced by the Koda family in the San Joaquin Valley since the late 1940s). You’ll need just a handful of other basic ingredients, a friend or two to help roll, several more to eat, and — most importantly — a break in your routine to enjoy the simple, sweet things in life. In a small, heavy pot, melt the sugar over medium-high heat. Swirl for even melting, but do not stir to avoid crystallization. When the sugar is a dark amber, remove from heat and pour in the water — take care, as it may splatter. Stir to melt the sugar completely. Add the ginger, return to low heat, and simmer for 10 minutes. 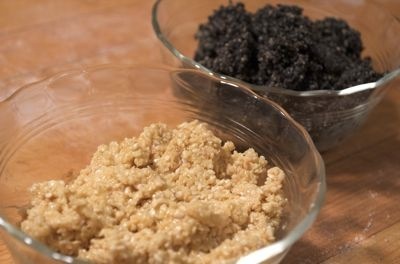 Alternatively, dissolve dark brown sugar in water and simmer with the ginger for 10 minutes. Don’t tell your mom. Remove the chunks of ginger and set the sauce aside. Toast the sesame seeds separately, taking care not to scorch them. In a mortar or pestle, blender or mini food processor, combine the white sesame seeds with 3 tablespoons butter, 2 tablespoons sugar and a pinch of salt. Puree to a thick, coarse paste. Transfer to a small bowl. Repeat with the black sesame seeds. Set both aside. 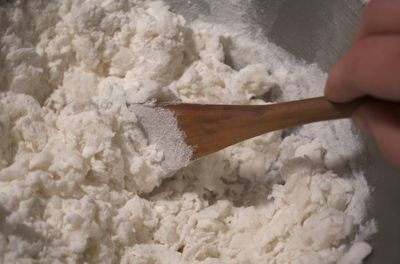 To make the dough: Place the rice in a large bowl and make dimples all over the surface with your fingers to encourage faster incorporation of the water. Pour the water evenly over the surface of the rice in a spiral, then immediately stir with a wooden spoon to mix into a shaggy dough. Transfer to a clean surface and knead for about 5 minutes to obtain a smooth, soft dough. Sprinkle lightly with additional rice flour, if needed, to prevent sticking to your hands or to the work surface. Roll the dough into a long log, cut into 24 pieces, and set aside, covered with a moist cloth. To form the dumplings: Roll each piece of dough into a ball, flatten slightly, and then pinch up the outer edge to create a small bowl. 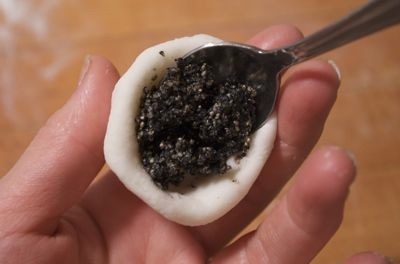 Place about 1/2 teaspoon of sesame filling into the center, then gather up the side and pinch together to seal tightly. Roll again between your palms, pressing gently, to create a smooth ball. Continue with 18 of the pieces. 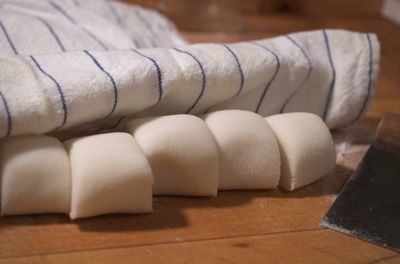 Cut the remaining 6 pieces of dough into 4 smaller pieces, then roll each of those into a compact ball with no filling. To cook the dumplings: Bring a large pot of water to a boil. Add the large, filled dumplings and boil for about 5 minutes. Add the small, unfilled dumplings and continue boiling for another 2 to 3 minutes. The dumplings will float to the surface of the water as they cook. Turn occasionally to keep them moist and evenly cooked. Remove them from the water with a slotted spoon, place in a bowl of cold water to rinse away excess starch, and then transfer to the ginger syrup. 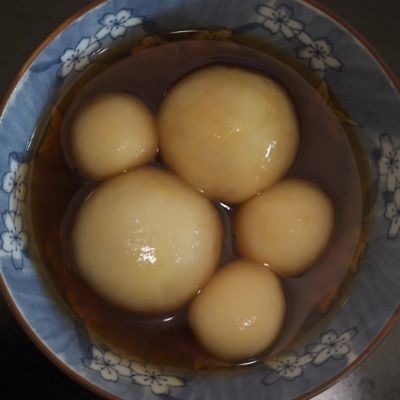 Serve in individual bowls, mixing large dumplings with small ones and drizzling generously with the syrup. Thank you for the cultural history and photos with the recipe. I enjoy reading about sweet & savory holiday food. This can be added to my list. Sweets are my favorite year round. There’s a dessert & port/madeira wine pairing on Jul. 13, hosted by Battledish & Sally’s After Dark. I can’t wait to see how they pair the seasonal dessert with each wine. Hope you can make it, and keep on blogging!